Wat Si Chum is one of the more unusual and significant 13th century monuments in the ancient city of Sukhothai. A monumental Buddha is almost encased in a square building and an inner staircase circumambulates the statue with depictions of the Jataka tales, which talk about the past incarnations of Buddha. The wat is the subject of focus in a new book ‘Past Lives of the Buddha’ which is reviewed in this article in the Bangkok Post. You may place an order of the book on Amazon here. 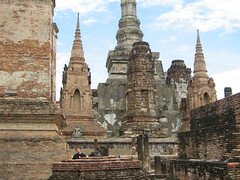 Wat Si Chum in Sukhothai is perhaps the most intriguing of old Siam’s monuments. The peekaboo view of the image through the slit entranceway gives the building a secretive air. Louis Fournereau’s photographs from 1891 bathed the ruins in an atmosphere of ancient enchantment. The massive walls hide a narrow twisting staircase roofed with beautiful engravings of Jataka tales. Curiously, there are only 100 Jatakas illustrated, rather than the 500-plus usual for such displays. The roof seems to have totally disappeared. Inscription Two, found inside the temple, is so rich and jumbled that there are at least four interpretations of what it says and means. This mystery has invited imagination. Most people have imagined the roof was an inverted bowl shape by analogy with similar looking buildings such as Wat Phaya Dam in Si Satchanalai. Eighty years ago, George Coedes proposed that the Jataka engravings had been moved from an original location at Sukhothai’s Wat Mahathat. Griswold and Prasert endorsed this idea on grounds that Jatakas were meant for “edification of the general public”. Betty Gosling ingeniously reconstructed how they might have appeared at Wat Mahathat, and suggested they had been “hidden away” in Wat Si Chum after a liturgical schism.